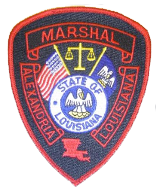 The Alexandria City Marshal's Office has three main divisions: Bonds & Fines, Civil, and Warrants. Bonds and Fines employs four full time workers and one student worker. The staff in Bonds and Fines work tirelessly collecting fines, preparing the court docket, activating warrants, composing letters on missed court dates, sending suspension slips to D.M.V., releasing jail inmates, answering phones, balancing money collected, rescheduling court dates and keeping all files coordinated. On court days, they are responsible for all jail docket and sentencing of inmates. They also check for any outstanding warrant for those who appear in court. Bonds and Fines is also responsible for maintaining all warrants issued through city court. The Civil division employs four full time deputies (two, which are P.O.S.T., certified) and three part time deputies. The civil division has always been busy, but lately it has exploded. The recent increase in Alexandria City Courts jurisdictional limit from $10,000 to $35,000 and now to $50,000 has put the brunt of the workload on the civil department. The deputies in the civil department will serve or attempt to serve anywhere from 10 to 40 (citations, summon, judgements) per day / per deputy. The civil division is also responsible for seizures and evictions. The Warrants Division currently has two full time P.O.S.T. certified deputies, which are responsible for arresting any suspect with a warrant through Alexandria City Court. With well over 10,000 warrants currently active through the Alexandria City Court, there is always someone to arrest. Even though there are only two warrants officers, they are responsible for hundreds of arrest in the past few years.